Burgers, like people, need to make a strong first impression. That initial appraisal, the slow sizing-up of the meal before you, can contribute a lot to the lasting memory of a meal. 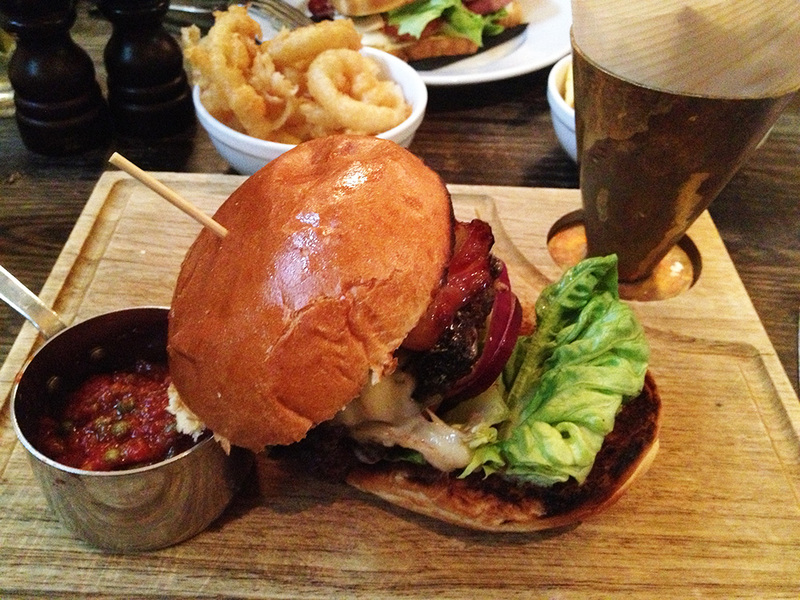 In the case of the PdV Burger at swanky public house Pub de Vin, my first impression was ‘Go home, you’re drunk.’ Barely held together by its skewer, the burger was lurching off to the side so violently it was about to take a fatal dip in the dainty little container of tomato relish sat beside it. For a simple reason – it was too god-damned big. We sat down for lunch in Pub de Vin just after midday on a Saturday, and thought we had stepped in to a morgue. The room was dingy and quiet. A middle-aged couple, whiling away their time over a newspaper and book, watched us sit down a few tables away from them and shortly after asked for their bill. Which was odd, as we’d already lowered our tones to stay consistent with the ambience. It being a rather swanky establishment, we decided to order starters before our mains. I settled on garlic mushrooms on toast, which was generally pretty good, although exceptionally garlicky and a touch too much rocket for my tastes. My fiancé plumped for the smoked mackerel paté, which looked very decent indeed, prompting immediate food envy. 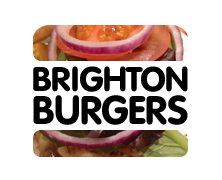 But you’re not here for starters – you’re here to read about burgers, so let’s talk about the PdV burger in a little more detail. So, yes, the fact that the burger had collapsed off to the side in its transit from the kitchen to the table was a bit of a disappointment, curiously. The whole shebang had distended like an accordion, its ingredients isolated and laid bare. 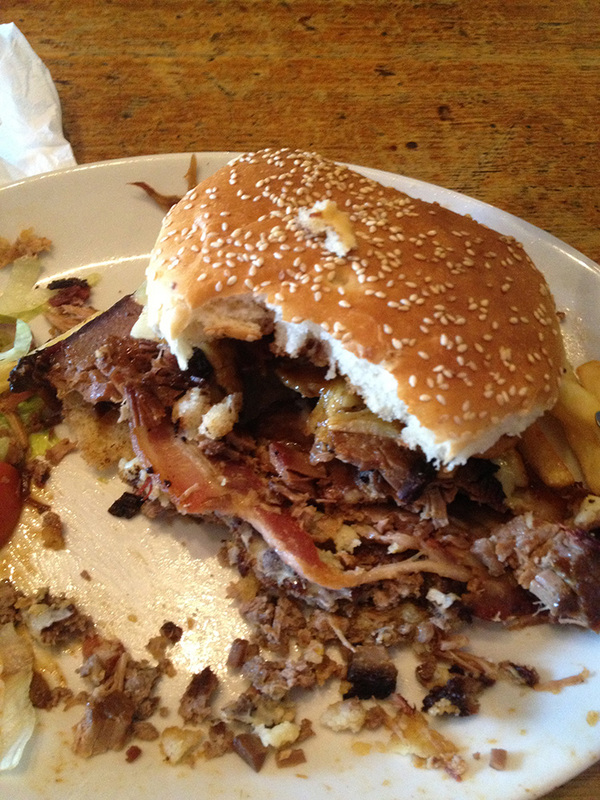 Even when I carefully reassembled everything, the PdV burger was absurdly big, far too chunky to pick up without wearing its innards down my Saturday best, or dislocating my jaw. I had to resort to cutlery, dissecting the burger piecemeal, with the unwelcome result of taking the odd mouthful of pure bun, or a large wet slice of tomato. A burger is intended to be bitten into, sampling everything it had to offer at once; eating the ingredients like this, the burger once again spreading itself over the plate, quickly became, dare I say it, a bit of a chore. That’s not to say that the ingredients were anything less than quality though, and you would hope so for the princely sum of £14.50. 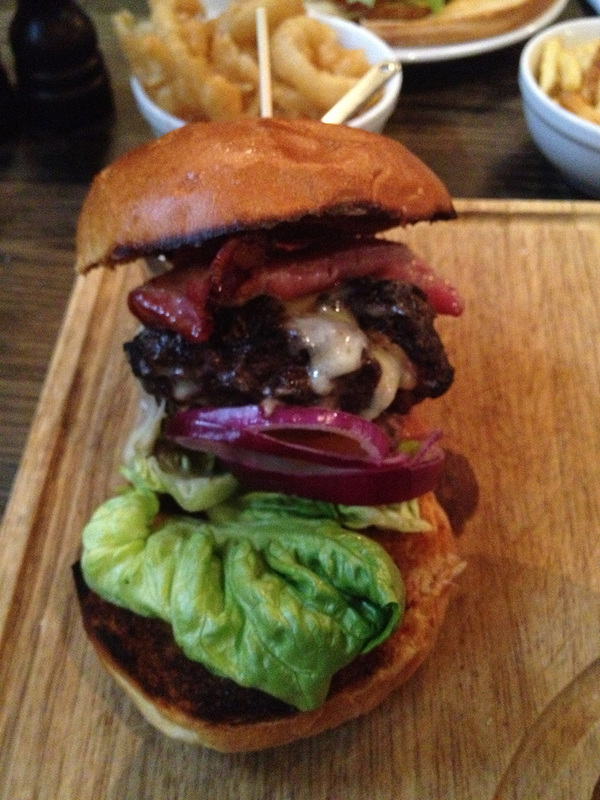 The patty was coarse, chunky and charred beautifully, the bacon fleshy and meaty. The gruyere, incredibly pungent when the platter was brought to the table, was curiously bland. Salad was plentiful and fresh, but no-one eats a burger for the green stuff. And, the homemade bun, taking its fair share of the blame for the bulk of the burger, was buttery and soft. But the whole failed to live up to the sum of its parts. Now, these were good. Ensconced in a metal cone propped up in a corner of the platter, these light, crispy fries were very tasty, and seemed to go on forever. The sheer quantity of them helped round out the value of what was essentially a very pricey burger and chips. Having heard great things about Pub de Vin’s big brother Hotel de Vin, I was expecting big things from this chain. Perhaps my expectations were too large, or perhaps the eerie quiet and sombre lighting inside dampened my spirits a little. The ingredients of the burger were undoubtedly of good quality, and the presentation of the meal could not be faulted, but the overall experience was disappointing, almost emasculating me with its size and reducing me to the shame of eating my burger with knife and fork. In general, the food here was good, evidenced in our starters and my fiancé’s club sandwich, but bistro burgers seem to suffer when subjected to the rules of fine dining. Give me a cheaper, dirtier, greasier burger any day of the week. 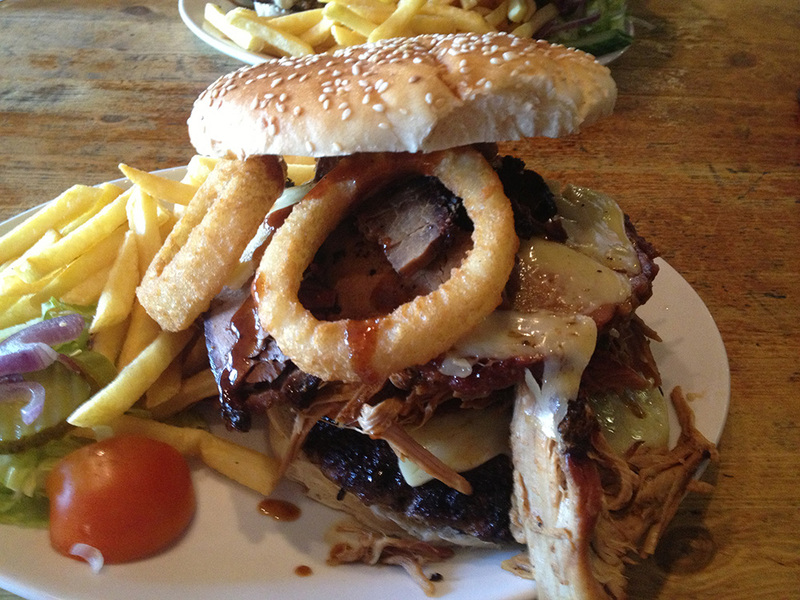 The inaugural burger for the Brighton Burgers blog couldn’t have gone less smoothly. I had intended (along with my intrepid burger-ing companion, my fiancé) to make JB’s American Diner my first review. But it seems that a lot of other people hanker for a burger on a late Saturday afternoon too. Having been before, I knew it got busy, but this time it was heaving. They’d even removed the pool table since my last visit in order to cram in more tables. The waitress took my name and number, quoted a 30 minute wait, and ushered us out the door with a smile. We decided to pass the time by drinking cocktails around the corner at Doctor Brighton’s. We managed two each, in just over an hour, before realising we weren’t getting a call. Chalking up a black mark for JB’s future entry on this blog, we instead headed for The Globe, a pub situated on Middle Street. And there it was, standing out like sore thumb on the menu – the heavily American-influenced Krispy Kreme Bacon Cheese Burger. How could one not plump for that concoction – something you’d more likely find on Man Vs. Food than on the menu of a British public house. 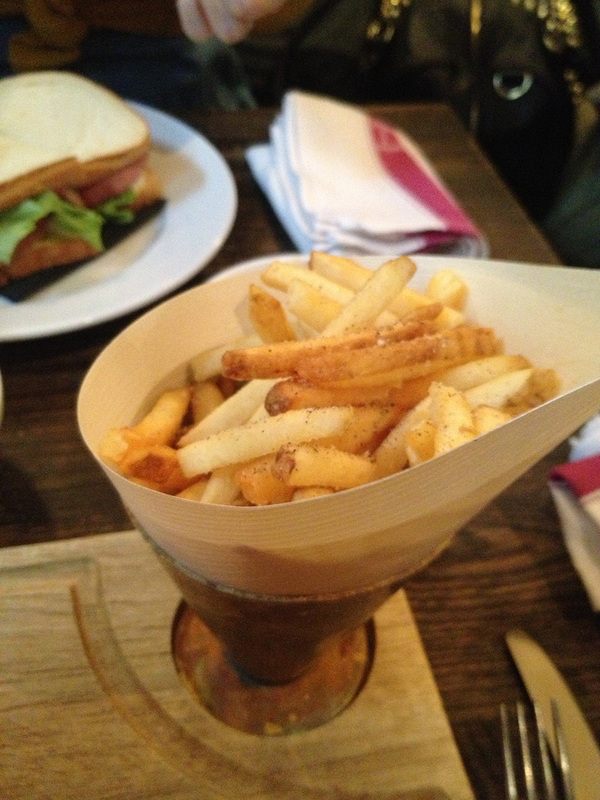 It came with chips included in the price, but we upgraded them to the Cheese Fries for an extra quid. The Krispy Kreme Bacon Cheese Burger is pretty aptly-named, as it turns out. A single patty, melted American cheese and crispy strips of bacon are lovingly sandwiched between two halves of a glistening Krispy Kreme doughnut. Initial impressions are underwhelming – the burger is almost comically small. Perhaps just a touch bigger than a slider. The patty is thin but dense, the bacon crispy indeed. But the overall dominant taste is that mouthful of sugar that bookends the ingredients – the other components of this ludicrous burger just don’t stand a chance, and the overriding feeling is one of eating a dense doughnut and not a burger. Luckily, The Globe make up for the size of the burger with a mountainous pile of fries, served in a plastic basket alongside the main event. Drenched in cheese sauce, mustard and mayo, these were heavy on the condiments but high in satisfaction, and formed the bulk of the meal. So great were the quantity, that they were impossible to finish. They could have done with more of the cheese sauce and less of the other condiments, but this is a minor nitpick; unlike the burger, I’d happily order these again. Dimly lit but unique, The Globe is a decent boozer to while away an hour (or five, in this case) on the seafront on a sunny Saturday afternoon. The incessant chug of the paddles on the wall of the upper bar is the main talking point, but they also have a large basement bar with retro consoles set up for those impromptu sessions of Mario Kart. They also have a Basement Cinema night every week – free film, free popcorn and a ‘text your order’ service. The service was also very amiable during our visit, but no salt and pepper on the table is a cardinal sin in my eyes. A memorable meal but not a particularly excellent one. 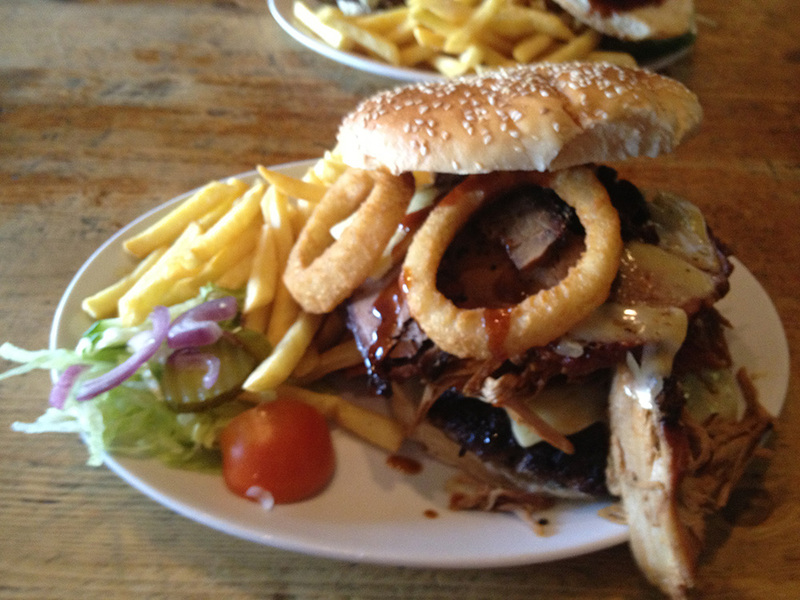 The burger was unusual but needed a stronger patty, better bacon and much more girth. The fries were oversaturated with condiments but still enjoyable. The presentation – arranged on a tray lined with red-and-white-striped paper – was a nice touch that evoked memories of hamburger chains from across the Atlantic.